Beautiful mottled bark on an American Sycamore in winter. The Sycamore that you are probably most familiar with is the American Sycamore- but the name Sycamore actually can refer to other types of trees in other parts of the world. 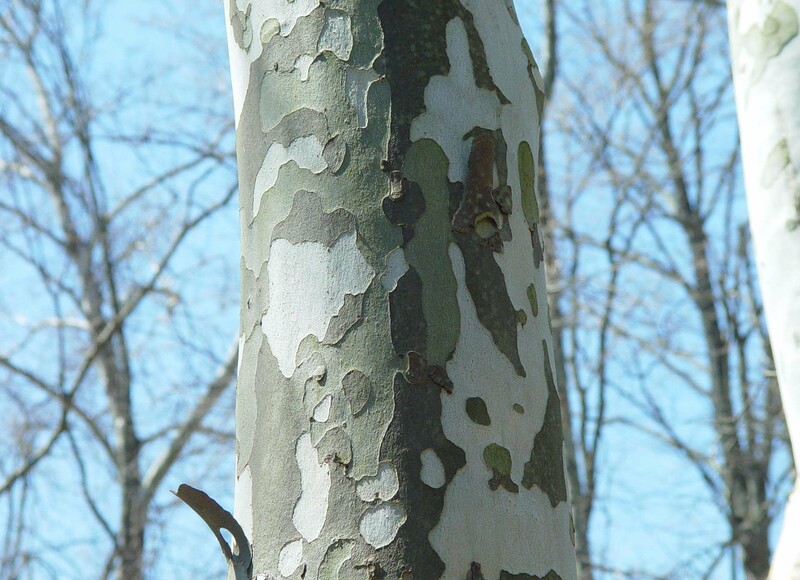 The American Sycamore is easy to identify by its exfoliating bark, which sheds off irregularly, creating a beautiful mottled bark with light greens, grays, and browns. These trees are known to typically grow from 95-131ft tall, and from 5-6.5ft in diameter when given ample space. While the average size for this tree is certainly respectable, the American Sycamore’s ability to grow to a very large size has made it a famous tree in more than once instance! In 1774, a settler of the Shenandoah Valley named Joseph Hampton supposedly lived with his two sons in a hollow sycamore, and in 1770 George Washington recorded a sycamore measuring 44ft and 10in in circumference from only 3ft off the ground. That’s massive!! Two young adults embrace the Buttonball Tree in Sutherland, Massachusetts. Speaking of extra large Sycamores- If you’re in the mood for a trip, you can make the trek to Sutherland, Massachusetts to witness the Buttonball Tree. Buttonball is a nickname for the American Sycamore, but this particular American Sycamore has taken the name for its own, due to its size and popularity. A remnant of Sutherland’s forests, this tree is 113ft high with a girth of 24.7ft. The Buttonball tree is estimated to be anywhere from 350-400 years old! Do you have, or know of, an especially large tree around Richmond or its surrounding counties? Send a photo to us at leah@arborscapesllc.com, we would love to see it!